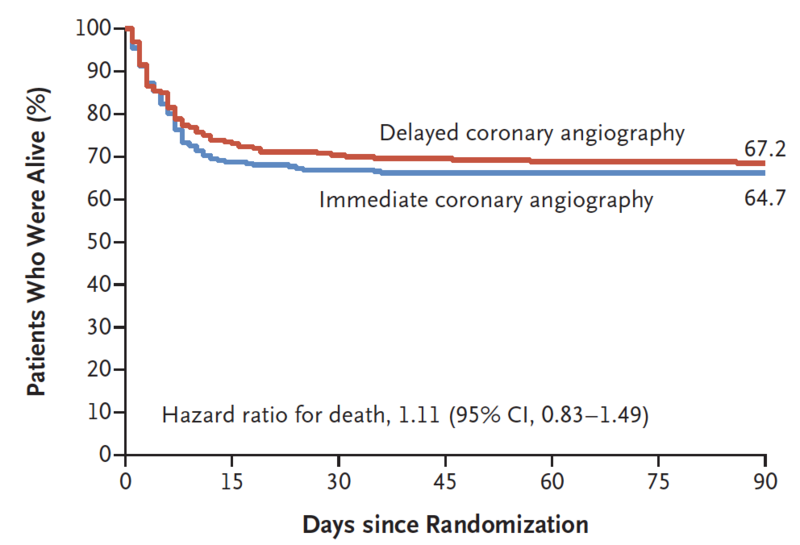 There was no difference in 90-day survival or other outcomes with immediate vs delayed cardiac catheterization in patients who were post-cardiac arrest and had no STEMI criteria on ECG. Ischemia is the most common cause of arrest. Current guidelines, “suggest emergency cardiac catheterization laboratory evaluation in comparison with cardiac catheterization later in the hospital stay ,” even without STEMI on ECG. In a prior study, 1/3 of patients without ST elevation on ECG post-arrest had culprit lesions vs 70% who had ST elevation when taken for cardiac catheterization immediately post-resuscitation. Is there benefit to immediate cath, or would a delay until after neurologic recovery be just as good? Cath post-arrest - what’s the hurry? This was a RCT called COACT, with 552 patients with no evidence of STEMI after being successfully resuscitated from cardiac arrest. Patients were included in the study if they had an initial shockable rhythm and were unconscious following ROSC. They were randomly assigned to either immediate cath or cath after neurologic recovery (generally, once they were out of the ICU). The average length of time after arrest to cath was about 2 hours in the immediate group and 5 days in the delay group. For the primary outcome of 90-day survival, there was no difference, 64.5% vs 67.2%, respectively [OR, 0.89; 95% CI 0.62 to 1.27; P = 0.51]. Hazard ratio was slightly, but not statistically significantly, higher in the delayed group (see figure). There was a slight increase in time to target temperature for the immediate cath group. But there was no difference in additional secondary outcomes, including 90-day survival with good neurologic outcome, major bleeding, shock, acute kidney injury, or others. What this means is there is no rush to take patients to the cardiac cath lab post-arrest if they do not meet STEMI criteria on ECG.